An OS-M series rocket illustration from the OneSpace webpages. HELSINKI — Chinese private companies OneSpace and iSpace are making progress with plans to attempt their first orbital launches in the first half of 2019. OneSpace is currently working toward a launch of its OS-M rocket that could come as early as late March, following engine tests for the four stages of the launch vehicle in the second half of 2018. The 19-meter-tall, four-stage OS-M will be able to carry a 205-kilogram payload to 300-kilometer low Earth orbit (LEO), and 73 kilograms to 800-kilometer Sun-synchronous orbit (SSO), but the payload for the maiden flight has not yet been disclosed. Should the OS-M put a satellite in orbit would be the landmark first successful orbital launch for a privately-owned Chinese company. At least 10 such firms have emerged since a Chinese government policy shift in late 2014 to allow private capital into the launch and small satellite sectors. The first attempt at an orbital launch, by Landspace in October, ended in failure after an issue during the third stage of the Zhuque-1 solid rocket, seeing the small satellite payload fall into the Indian Ocean. Landspace has however since moved on to secure $43 million in funding, opened an 'intelligent manufacturing base' in Huzhou, and has made progress with tests on gas generators and combustion chambers for the Tianque-12 80-ton-thrust liquid methane and liquid oxygen rocket engine which will power the larger, two-stage Zhuque-2, with the aim of a maiden flight in 2020. OneSpace in September 2018 carried out its second suborbital mission with the launch of its 9-meter tall, 0.85-meter-diameter OS-X1 solid rocket at the Jiuquan Satellite Launch Center in the Gobi Desert, giving the company experience Landspace did not have going into its launch. Just two days earlier another firm iSpace, also known as Beijing Interstellar Glory Space Technology Ltd., lofted its own single-stage rocket, the Hypebrola-1Z, marking the first launch of a Chinese commercial company from a national space center and indicating the high level of support from space authorities. iSpace, established in 2017, has also quietly been making progress toward reaching orbit and in a recent press release stated it would launch three launch vehicles in 2019, with the first of the Hyperbola-1 orbital series to launch in the first half of the year. The Hyperbola-1, with three solid stages and fourth liquid stage, has a 1.4-meter diameter, a length of 20 meters, a takeoff mass of 31 metric tons and can deliver 150 kilograms of payload to a 700-kilometer-altitude SSO. In September the company advertised 80 kilograms of capacity still remaining for the launch, which was then stated to take place in April from Jiuquan. While the companies emerging in China's nascent commercial launch sector are being backed by private funds, the firms are also apparently receiving significant support from the State Administration for Science, Technology and Industry for National Defense (SASTIND), a government body overseeing the country's space activities. A national military-civilian integration strategy is also crucial to the progress made, facilitating the transfer of required and sensitive technologies to the startups, as well as opportunities to share facilities and expertise. Also working in the background are Linkspace, a company formed in 2014 and dedicated to developing an orbital launch vehicle, named NewLine-1, capable of vertical takeoff, vertical landing (VTVL). Earlier in January Linkspace tested an 8.1-meter-tall, 1.5-metric ton demonstrator powered by five variable thrust engines which successfully carried out hover tests. A new and larger iteration likely analogous to the SpaceX Grasshopper in function will perform a suborbital flight later in 2019, according to the firm, before a maiden launch of NewLine-1 in 2020. Jiuzhou Yunjian, founded in 2017 and part of a second wave of Chinese launch-related companies up, tested a combustion chamber for a 10-ton thrust methalox engine named 'Lingyun' in December. Other new firms in this category include Galactic Energy (Chinese), working on a small solid launcher and much larger kerolox rocket, and S-Motor, which is developing an unnamed three-stage solid-propellant small launcher for which it tested an engine in November. 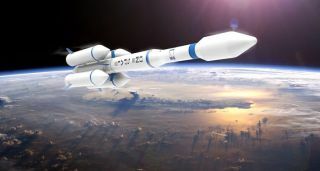 The main contractor for the Chinese space program, the China Aerospace Science and Technology Corporation (CASC), is not only assisting some of these new companies but is also developing its own light-lift launchers for the commercial market. The Long March 11, which had its sixth mission Jan. 21 lifting four small commercial satellites into sun-synchronous orbit, is being prepared for a first sea launch around June, utilizing a converted vessel to provide low inclination launch opportunities. A Long March 11 launch vehicle undergoing assembly ahead of launch from Jiuquan on Jan. 21. Chinarocket Co., Ltd., operating under CASC, is developing the 'Smart Dragon-1' (Jie Long-1) solid micro launcher, designed to be "fast, agile and flexible" and capable of putting 150 kilograms into a 700-kilometer SSO. It could have a test flight in the coming months. Another series, Tenglong, is under development by Chinarocket and will feature liquid propulsion and VTVL capabilities when its debuts in the next 2-3 years. Further crowding the field will be the China Aerospace Science and Industry Corporation (CASIC), the missile maker, defense giant and sister state-owned enterprise to CASC. Through its subsidiary Expace it is expected to launch more of its commercial 20-meter-tall, 1.4-meter-diameter Kuaizhou-1A solid rockets (200 kilograms to 700-kilometer SSO) in 2019, with the larger Kuaizhou-11, which may lift as much as 1,000 kilograms to the same orbit, expected to debut in the next few months. The launch market is not expected to support all of these various entities and their launch vehicles, but the apparent support across the board for private and traditional state-owned efforts in the commercial sector indicates that this is a national strategy aimed at stimulating innovation in space launch capabilities to benefit China, whichever companies emerge to be successful.